Can I replace the vanilla extract with 1 pod of vanilla beans? Thanks! Surely you can. Let the vanilla beans steep in 2 to 3 tablespoons of hot milk to enhance the flavour. 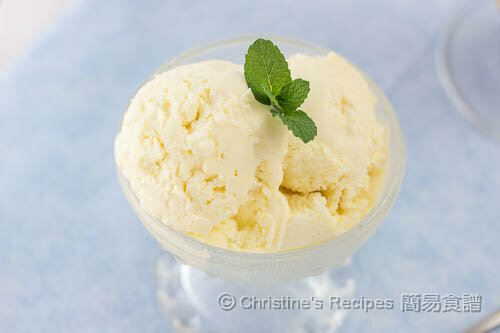 I've tried to make the vanilla ice cream over the weekend. The texture is good. But I find it too sweet with the very strong condensed milk taste and very oily. Do you think I can replace the condensed milk with fresh milk + sugar? Thanks! You might try decreasing a bit of condensed milk to suit your personal taste. 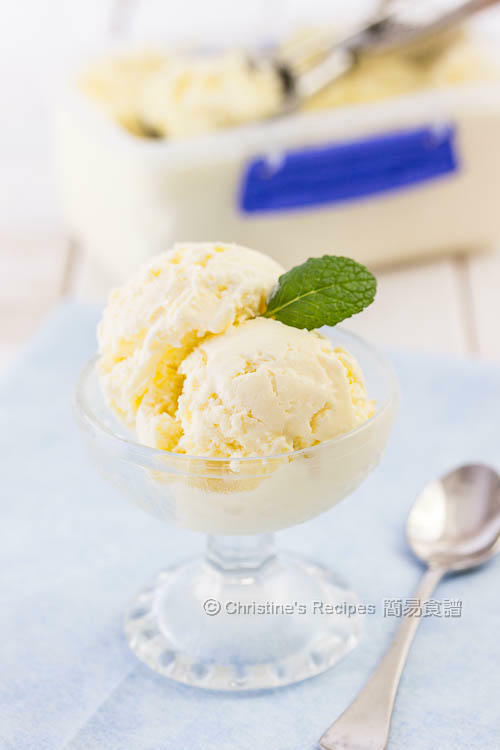 I read some articles that vanilla ice cream should add egg yolk. What the diff with or without egg yolk? There are various ways to make ice cream. 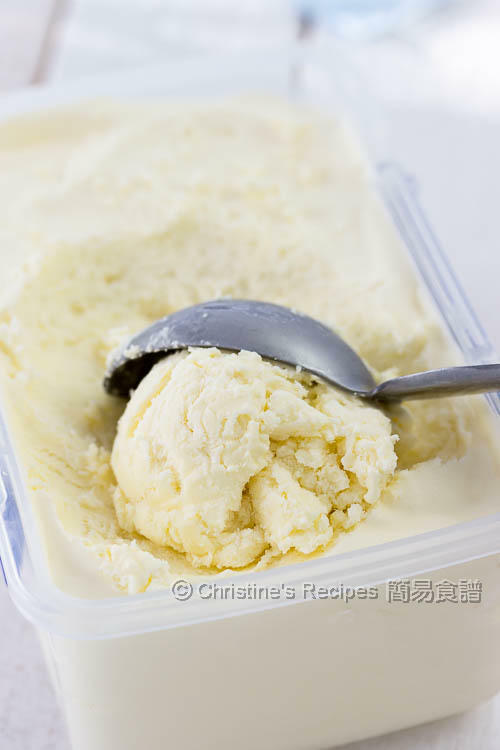 To make French-style ice cream, we have to temper the yolks and make a custard base. Different ways of cooking can make different styles of dishes. There are no right or wrong ways. You are so wonderful! Always share with us about nice recipes! Can I ask if add coco powders or green tea powders, how mach should I put and which step should I put it in your recipe? All depends on your taste. Simple add as much as you like. This recipe is so forgiving. "分三次拌入煉奶中": You do this while you are stirring the whipping cream, correct? Thanks! Not quite sure what you meant. Are you asking about how we go about adding the whipped cream? Add your whipped cream into the condensed milk by folding-in. That would keep as much air in the icecream. I was wondering for coffee flavour what kind of powder do you suggest? and for chocolate flavour do you just use the baking coco powder? Ok, will make the coffee flavor version and post it soon. Hope this will help you get the idea. Thanks for your patience. 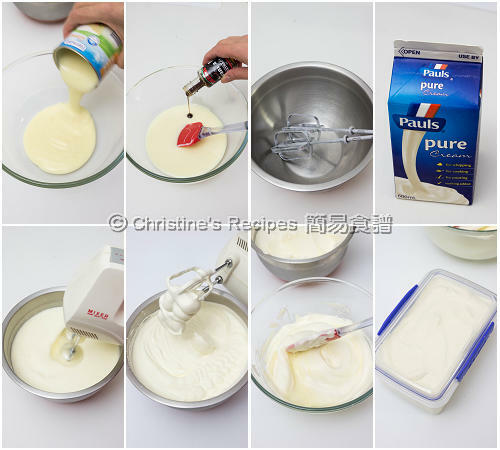 Hi Christine, 您好, 請問 whipping cream 打發至蓬鬆軟身, whipping cream 會是怎樣狀態? 流質狀? 可以嚏花狀態? 因我不太懂得打 whipping cream , 請指點, 謝謝.